I just picked up an old Allis Chalmers B212 tractor with a 36 in tiller attached but I need a drive belt for it. I don't have the manual and I was hoping one of you knew how long this belt is. I think it is 36 inches but not 100% sure. If you can not find the information on the net take a string and run it around the belt area, mark the length and measure it. Make sure you have the right tension on the string so it is tight but not to tight. Your tiller should have an engage tines and an unengaged lever, the difference between engaged length and unengaged length is about an inch on most things. Your local hardware store should have one. tomf wrote: If you can not find the information on the net take a string and run it around the belt area, mark the length and measure it. Make sure you have the right tension on the string so it is tight but not to tight. Your tiller should have an engage tines and an unengaged lever, the difference between engaged length and unengaged length is about an inch on most things. Your local hardware store should have one. I was able to finally find a parts break down on the web but it was not easy. The belt should be here today. Belt showed up the same day I got it back from the shop. I had them redo the carb it was leaking a bit. She runs like a top. 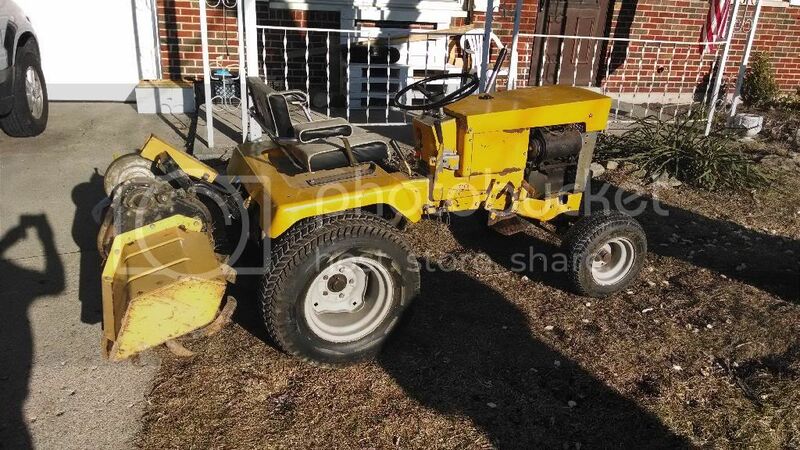 Does that garden tractor have a PTO, I see the top arm, so the belt was from the pto to the tiller? tomf wrote: Does that garden tractor have a PTO, I see the top arm, so the belt was from the pto to the tiller? The tiller is all belt driven. It runs back under and has a engagement lever on top of the tiller. It does have a PTO shaft out the front of the tractor that I plan on running a spiral log splitter off of.